HX OUTDOORS ZD-020 is a tough pocket folder with a 2.25" extra-wide drop-point blade, ideal for slicing and almost any other cutting task. Made of high-performance 8Cr14MoV steel, the Swerve's blade offers strength, edge retention and resistance to wear and corrosion, while its rugged stonewashed finish hides scratches, giving the knife a roughened style that always looks new. Jimping along the blade's spine also provides users a thumb rest. Ergonomic G10 anti-slip handle, for enhanced grip in wet conditions. Equipped with SpeedSafe assisted opening, the Swerve is easily opened with one hand by pulling back on the flipper or pushing down on the thumbstud. The liner lock ensures a secure blade lock-up during use and is easily deactivated with a single hand for transport, while a left/right reversible deep-carry pocketclip allows convenient discreet carry. You're going to like this one. 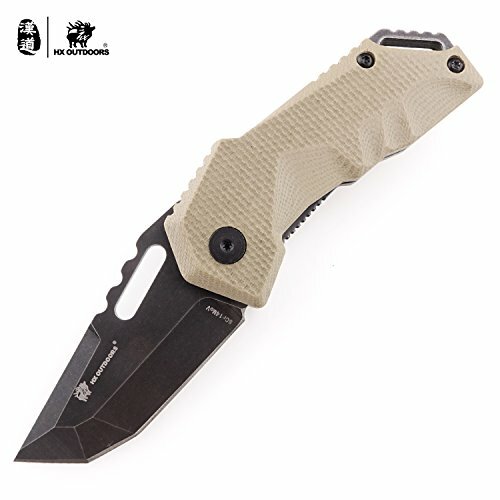 Its designed to be a right-sized, tough, every day carrying and work knife. The extra-wide, drop-point blade offers excellent slicing and will handle just about any other kind of cutting task as well. 8Cr14MoV steel makes the blade sturdy and offers good edge-holding capabilities. Unusual jumping on the blade back adds style without being so aggressive that your thumb complains. A stonewashed finish hides scratches. For a good grip, the Swerve has a contoured handle that "swerves" slightly to fit comfortably in the hand. Ergonomic G10 anti-slip handle. The Swerve opens one-handed with Speed Safe with either flipper or thumb stud. For convenient carrying, it also has a reversible, deep-carry clip. Flipper: May be used on either manual or assisted opening knives.